Whether your kids are walking to school, the park or a friend’s house, here are a few simple tips to make sure they get there safely. Unintentional pedestrian injuries are the fifth leading cause of injury-related death in the United States for children ages 5 to 19. Teenagers are now at greatest risk. Teens have a death rate twice that of younger children and account for half of all child pedestrian deaths. 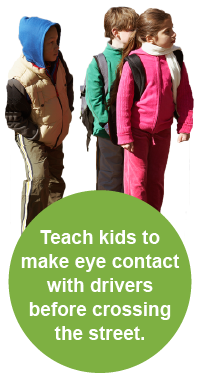 Teach kids at an early age to look left, right and left again before crossing the street. Then remind them to continue looking until safely across. Teach kids to put phones, headphones and devices down when crossing the street. It is particularly important to reinforce this message with teenagers. It’s always best to walk on sidewalks or paths and cross at street corners, using traffic signals and crosswalks. If there are no sidewalks, walk facing traffic as far to the left as possible. Children under 10 need to cross the street with an adult. Every child is different, but developmentally, most kids are unable to judge the speed and distance of oncoming cars until age 10. Be a good role model. Set a good example by putting your phone, headphones and devices down when walking around cars. Here are a few more tips on how to keep kids safe while on foot, as well as some tips for walkers and drivers on Halloween. List of helpful links to other pedestrian safety resources.